Jurassic World is one of the most ridiculous movies I have ever seen. the previous 2 entries is ridiculous enough but that this is what they came up with is…mindboggling. I won’t say it’s as bad as Jurassic Park 3 which was plainly terrible. But it is at least is insane as the last 20 minutes of The Lost World: Jurassic Park. This film asks us to imagine a world 22 years after the first film in which the titular park has not only opened to the public but become so wildly successful that people are now bored with the idea of resurrected extinct species. So bored are the public that the scientists at the park have decided to hybridize a whole new dinosaur. They call it an Indominus Rex. Seriously. The film also asks us to buy that Chris Pratt’s ex-Navy SEAL security consultant character has bonded with a pack of Velociraptors and become thier Alpha. Also that he is totally unaware that Vincent D’onofrio plans to “weaponize” this Raptor pack, and other trained dinos. Yes, that is really a subplot of this movie. 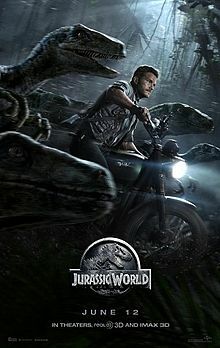 I could go on; the precocious kids (Ty Simpkins and Nick Robinson) who enjoy time at the park while their parents go through an entirely off screen divorce, the quirky control room operators (Jake Johnson and Lauren Lapkus) who provide comic relief in the face of the horrific violence, and even Bryce Dallas Howard’s totally inappropriate dinosaur chasing outfit. And the ending! The ending is NUTS! What this movie does right, what the franchaise has always done right, is the effects and here they are typically amazing. The new dinosaur looks great, once you see it, the park itself is amazing, you know the drill. If you’re predisposed to seeing this you will and you will enjoy the ride.